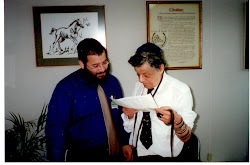 Rabbi Levi made a real difference in the life of my family. Without him, his rebbetzin, and other members of Chabad of Tysons Corner, my nephew would not have had a bar mitzvah. With his help we celebrated a beautiful simcha. We also spent a most meaningful Shabbos with the Deitsch family. The warmth and inspiration at his Shabbos table will be something that we will always remember. Rabbi Levi is a guide for Klal Yisroel; he is a role-model and a leader. We wish his wife, children and the entire community nechumim.